To celebrate 1,500 email subscribers, I am giving away a brand new gift-boxed Tojiro Sha Ra Ku Mono Chefs Knife, valued at $218! Designed by Komin Yamada and used by famed chef Heston Blumenthal, this beautifully crafted knife is a delight to use. To enter, simply follow the steps below telling me what you would like to see more of at Wholesome Cook! Giveaway is open worldwide. The Tojiro Tojiro Sha Ra Ku Mono Chefs Knife expresses Japanese traditional beauty combined with modern feeling. Designed by Komin Yamada (designer of the original Global knife) and used by famed chef Heston Blumenthal, the Sha Ra Ku Mono offers superior cutting performance and durability which is both hygenic and food safe. The sleek one piece design is made of molybdenum vanadium steel, usually used for scalpels for its corrosion resistance, with an elegant and angular design finished off with hand-painted squares to identify the series. The sleek modern look has been acknowledged by the Museum Of Modern Art in NYC which displays one of the first sets manufactured. The blade is the business end of the knife. Heston loves these knives because of their unparalleled sharpness. This is achieved by using a thin layer of super hard vanadium / molybdenum steel which is extremely hard. The new Tojiro Sha Ra Ku Mono knives are built tough for heavy duty use day in and day out whether in a professional kitchen or in your home. The unique design of the graduated bolster sacrifices nothing in terms of comfort and balance but allows for easy re-sharpening all the way up to the heel of the blade. The end result is a totally smooth comfortable and well balanced feel. The beauty of the Sha Ra Ku Mono handle is in its simplicity. Elegant smooth flowing lines are comfortable to hold and easy to clean and keep sanitary. The square motif in the middle provides grip and is reminscent of the art and design of classical Japanese sword makers. STEP 1: take the poll below – you can tick upto 3 items on the list. This will grant you 10 entries into the draw once you complete step two. STEP 2: register your entry and the fact that you’ve taken the poll via Rafflecopter below. Bonus Entries: You can earn bonus points for 1) leaving a comment; 2) subscribing via email or being an existing subscriber; 3) plus earn daily entries by sharing this post on social media. 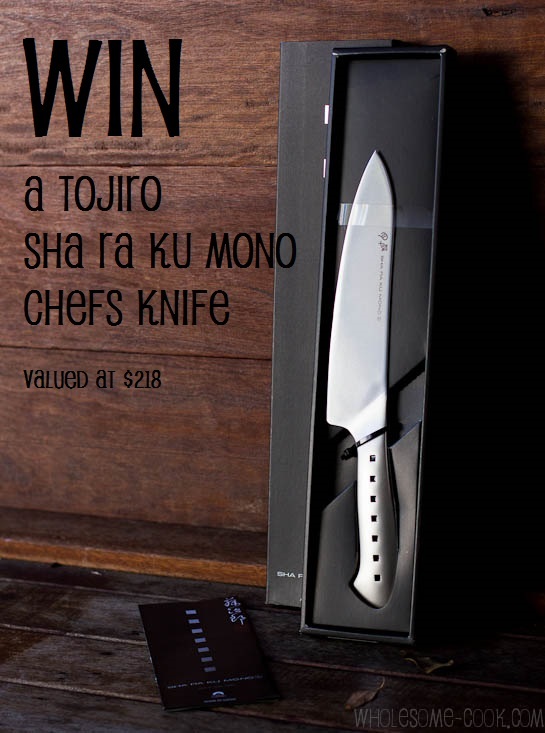 Terms: The prize is 1 gift-boxed Tojiro Sha Ra Ku Mono Chefs Knife. Giveaway is open worldwide. Entries close 11:59pm Sydney time on Friday 19th April. The prize is provided courtesy of me, Wholesome Cook, and valued at A$218. Winner will be announced on this post and contacted via email on Saturday 20th April. Hi Corinna, thank you. I’ll keep this in mind for future recipes in the growing list (see here) of egg-free recipes. Also, my new Guilt-Free Desserts e-cookbook is all vegan (therefore egg-free). You can check it out here. As a subscriber you would have received your 30% off discount code in the confirmation email too! Love any kind of Mexican food – thanks! Thanks Darryl, I love Mexican food too but haven’t really delved into it more than this handful of recipes inspired by the cuisine. Considering that I’ve had requests for “hidden” veggies, Mexican recipes might combine the two in one! Hi Nicole, thanks for the feedback. Low Fodmap is on my list of things to do, but thanks for the nudge :-). As for allergy-friendly – many of the recipes I create tend to be as such, or I make sure to include allergy-friendly substitutes. I’ll try to be more diligent with them. Always looking for hints and recipes for plant based egg free menus. Love your work! Any version of meat and three veg reinterpreted as a stir-fry that teenagers could manage would be great! Hi Jennifer, stir-fries are fantastic! Great for using up random veggies. You could start off with these: Soba Noodles (with octopus, but you could use chicken, beef strips or fish), Sweet and Sour Pork (add their favourite veg), Beef and Basil Pad Se Ew (my favourite flat-rice noodle dish). I will make sure to add a few extra recipes in the near future. Delicious ideas on what to do with lentils and other pulses. Hi Annie, that’s fab! Thanks for prompting me on these… We eat quite a lot of them so I already have a few ideas on what recipes to post! I’d like to see the same thing as Annie please. The only thing I’d change is to add a little more paleo-inspired recipes with healthy fats and good quality meats. Love your grain free, dairy free, sugar free work! Thanks Elizabeth! Ahh… the eternal struggle between the vegans / meat-eaters, I guess many of the recipes include suggestions for using substitutes either way. 🙂 I’m quite interested in the Paleo diet, especially since we already eat organic and free range meat, 3-4 times a week. I will make sure to add your request to the list. Thanks Tarshy Treasure – I will try to accommodate your request. Hi Narelle, thanks for the request. I’m scribbling it down in my recipe notebook right now. You’ve been following me for some time so you already know that while I cannot promise all vegetarian / vegan posts, many of my recipes include ingredient substitutes or omissions to cater for a wider range of diets. It may involve reading between the lines a little… sorry about that, maybe I can try adding a separate vegetarian printable recipe to the posts? Wow, Martyna, this knife is beautiful! A person could chop a ton of food with that baby. 🙂 Personally, I think you’ve got the mix just about right. Thanks Maureen, it’s hard to know sometimes (as you probably know!). I would love recipes which hide vegetables from fussy eaters!! Hi Angie, thanks for the comment. My best tip for hiding veggies is to steam them lightly then blend using a stick blender and mix into pasta, risotto, beef chilli for nachos. The other thing I had done with the kids is encouraged them to try a little. After a while they started to ask for some of their favourites, cooked and raw, even in their lunchboxes. Oh, and I also call certain veggies “names” that sound familiar: asparagus becomes asparagus beans, with the emphasis on beans because they like them. Quinoa (keen-wah) becomes Quinoa Rice. I will try to do a post about a few more of these soon! Hi Amanda, here are a few Quinoa recipes already on the blog. I have noted your request for more quinoa recipes – I am keen to explore it beyond what I have done. I also like buckwheat and barley (but that contains gluten). Also, do you mean more for baking or main meals? Love good knives which is a basic tool in good and healthy cooking! Cutting off fat on meat would be a breeze with that as would be cutting up a variety of interesting vegetables and fruit! thanks for the opportunity to use these amazing knives! Looking forward to hearing more about new products and foods available. Quick easy to prepare recipes are always a winner. Thanks Sibilla! Great request… I have done a few Australian recipes, including kangaroo skewers (a meat that’s becoming more and more popular because it is sustainable and lean), meat pies and lamingtons. My background is Polish so I have also featured a range of recipes from my home country here. I will keep adding to the collection and maybe add some commentary about customs too! love your blog! I appreciate the allergy friendly recipes you have and the vegan ones as well – always happy to see even more of those. Hi Leelee, thank you for your comment. I try to accommodate recipes for most of my readers, some as you will see will not be vegan or completely allergy-friendly, but I always try to include substitutes that will work for most people. Love all those budget-friendly recipes that really stretch the food dollars! It’s one area I haven’t fully explored so I am keen to include more Paleo recipes soon! Thanks for the prompt. More breakfast recipes? Like make-ahead breakfast ideas? I feel like I’m always searching for them. I know exactly what you mean TC. Breakfast is one of the most neglected recipe categories anywhere… My Dad used to soak his cornflakes the night before, but that’s just not my cup of tea. Will add to the list. Grain-free is definitely there to be explored! Thanks Jo, love your work! I’m always looking for good gluten free, vegetarian recipes that are not just sides! Good point Faye, I have quite a few vegetarian recipes and am currently working on a browsing structure that will enable you to filter both terms to find recipes on my site. Stay tuned. I’d love to see more allergy-friendly recipes (especially grain-free)! I love seeing allergy free recipes particularly those that are tree nut free. Also, recipes that can be made in 30 minutes or less :). Hi Tessa, thanks for the feedback. I am currently updating all my recipes to include the “nut free” category (added in the menu as well). Stay tuned for more quick meals too. Hi Gisselle, thank you for your comment 🙂 I am all for re-making traditional recipes into vegan / gluten-free. Good luck! Hi Rebecca, your comment made me smile. It’s hard sometimes. Personally, I like slow cooker recipes – you shove them in the oven, with lots of love, and have time to do other things. I am currently updating all my recipes with two new categories: slow cooker & meals under 30 minutes. Stay tuned for more ideas. Oh what I would do for this knife!! The ones I have at home are not so great whatsoever. I’m starting a blog myself so it would be awesome to have this for all my future cooking adventures. Just realized there was a specific question to answer 🙂 I would love to see any paleo-related recipes! Hi, Paleo is on my list of things to explore! And I have added a new category to the Recipe index for easier browsing, all recipes will be updated soon. Hi Tracy, thanks for the feedback. I am creating a new category (although quick and easy exists) but Meals in 30 Minutes is more to the point. All recipes will be updated soon for easier browsing. I would love to see quick, healthful meals. Thanks for having this awesome giveaway. Hi Rusty, you are welcome. I have created a new category “Meals in 30 Minutes” in addition to the “Quick and Easy” category. All recipes that belong will be added soon. And there will be more to come too. Thanks for the feedback. Hi Rachel, I hear you. I will make sure to list more readily-available ingredient substitutes where possible. WE have family living in rural India and they are in the same category as you. Will keep working on it. I would love to see desserts – those that are typically, rich, chocolately, somehow made a bit better but still rich and delicious tasting! Nice knife. I love Japanese knives. I am quite health conscious so I would love to see more low fat, low sugar recipes. I must admit I do still have a sweet tooth though, indulgent dessert recipes that with a healthy makeover would be of extreme interest and value! Hi Mandachic, sound like you need a copy of Guilt-Free Desserts. Loaded with 36+ low fructose (low sugar) and good fat recipes. If you subscribe, you’ll get 30% off too. My 9 year old son has decided to become vegetarian, any ideas or recipes would be helpful ! Wow, that’s a big step. I will be adding more vegetarian recipes, or options for sure. Make sure he is eating lots of leafy greens, beans and pulses for iron – combined with vitamin C fruit and veg as that increases iron absorption, and takes vitamin b12 supplements. any help with artichokes, i just started cooking them for the first time. ideas would help. More grain/legume/dairy-free recipes (aka Paleo). I’m always in awe of your sugar-free dessert recipes. I don’t make desserts very often, but sugar-less dessert recipes are rare and I could always use more ideas, so that’s what I’d say I’d like to see more of! Hi Allison, I used to be like you – didn’t make desserts often because I found them all too sweet. Hence why I had decided to publish my Guilt-Free Desserts ebook which contains 36+ sugar-free desserts and a whole overview of different types of sugars and sweeteners. Sarah Wilson’s I Quit Sugar cookbook is also great. Thanks, Martyna; I’ll have to check those out! I’d like more ideas on carb free and sugar free recipes. Always happy to explore this topic! I have all sorts of food allergies and recently have been hearing a lot about activated nuts/seeds/legumes. Would love some recipies to incorporate these nutrient rich foods. What a beautiful knife! Really. Leaving the knife aside – allergy-friendly recipes would be nice from my point of view. They would be very helpful, not for me but for my aunt with plenty of allergies. The problem is that she is allergic to almost everything – gluten, lactose, eggs, yeast and mushrooms, starch (rice, potatoes, corn, etc), crustacean and white fish, all sorts of beans, chickpeas atc., amaranthus, carrot, some nuts. It would be great to create a category for the extreme allergic group of people – I couldn’t find something like that. Small suggestion regarding gluten-free recipes – apart quinoa and buckwheat, millet (kasza jaglana). Thanks Wiola, that’s a good idea. My sister in law has very similar range of allergies actually, so it might be helpful to have a separate category that incorporates all of these. Or even a tickable filter box. Something to think about. Oh yes, tickable filter box sounds very good, you are clicking on the products you are allergic to and have the whole listing of the food recipes or ideas you are allowed to. I like your tickable filter box idea really a lot. It would be for sure helpful for many people. Separate category can be a bit troublesome since different people have different allergies, one ingredient makes a difference. I’d love to see more recipes for cold but ready-to-eat office lunch. My hubby doesn’t like the food sold around his office, but he can’t heat his lunch in his office because there’s no microwave oven. Hi Melissa, great point! No one likes a soggy sandwich… does he have access to a fridge? I’d like to see lunchbox friendly recipes! Hi Ally, noted and quite a few readers are requesting this so it’s on the list! Hi Colin, I don’t exactly know your background but about 10 years ago I was in the same boat. I loved food and was eating way too much. Of everything. I ended up cutting down my portions to dessert size plate and ate most things, limiting unhealthy oils, sugar, refined flours. It helped and I was happy eating the foods I loved. Most of the recipes on the site now would fall into the category of healthy so feel free to browse. I’ve also heard good things about apple cider vinegar to boost metabolism (have a tablespoon first thing in the morning), it gives you a nice wake up too! Wow, Jody! That’s a lot of dislikes. Are the fruit and veg ones from a while back or recent? If from the way back you can try incorporating a little into the dish and seeing what she thinks. If you email me a whole list of what she doesn’t eat, I will be happy to come up with a few recipes for you and email them back. I would like to see an easy coffee éclair recipe. I’ve tried making éclair for the first time a few weeks ago but my dough ended up to be too runny (+ I left them too long in the oven and the shells burnt). I would like the recipe to include only simple ingredients (ie: sugar, butter, flour) – no fancy things that I don’t have at home. Hi Cyndie, I have one! Check out my Eclair and Profiterole Recipe (yes, with coffee cream). I’ve been using that pastry for everything from eclairs, to Polish custard slice to churros. It’s a great one. I would love to see more low carb recipes. I love all of your recipes, and honestly I wouldn’t change a thing! Hi Sara, considering many requests for Mexican and grain-free, your healthy enchiladas idea might be coming to the blog sooner than you think! Hi Catrina, this is a popular request so I will definitely be adding it to the list. Hi Keely, I have a whole collection of over 36 sugar-free recipes available in my ebook, Guilt-Free Desserts. No honey, no agave plus a whole guide to sugar and sweeteners. If you subscribe, you will receive a 30% discount code for the book. You can read more here. I would like to see more of what you’ve been bring, healthy, yummy recipes that don’t make you miss the stuff that doesn’t nourish your body. Fantastic knife for the giveaway. I really like the idea of meals that can be prepared in under 30 minutes given we all seem to be so time poor these days. Allergy (gluten-free) recipes and vegan recipes. What a kick-a** knife! I would love a quick vegie lasagne recipe. Would love diabetic friendly recipes. How about some Greek or Mediterranean foods? Anything easy to make, healthy and tasty is always nice. Can you do Asian vegan dishes! It is impossible to find one on the internet without containing eggs! Coeliac friendly recipes – we have a coeliac in the family and another person who avoids gluten so gluten free recipes are always welcome! I love Indian and Middle Eastern Foods so would Love to have Them Featured. I love Veggie Burger recipes. I like to know how to use actual food in cooking but still cut down calories!